Exterion Media, Europe’s largest privately owned Out-of-Home company, has launched Exterion Live, its brand new experiential offering. Exterion Live will be able to provide end-to-end management of experiential campaigns across five core environments: transport, retail, urban, sports and entertainment, through existing advertising partnerships with Transport for London (TfL), National Rail, Westfield, London Designer Outlet (LDO) and Wembley Park. 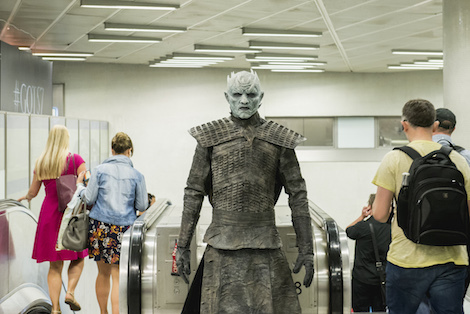 We’re told that Exterion Live will enable Exterion to build innovative, integrated advertising and experiential campaigns on the TfL Rail estate, such as the recent Game of Thrones activity for Sky Atlantic at King’s Cross St Pancras Tube station , which was developed through Hello London – the media partnership between Exterion Media and TfL. Exterion Live will initially have access to 20 sites on the London Underground, including major stations King’s Cross, Canary Wharf, Tottenham Court Road, Waterloo, Shepherd’s Bush and Farringdon. The portfolio will include all Exterion’s National Rail partners, to cities across the UK. Stations such as Castle Cary during Glastonbury and Aintree during the Grand National, will give brands a unique opportunity to implement tactical activity specifically around the event. Exterion Live will offer integrated, data-driven brand experience opportunities to advertisers looking to provide holistic outdoor campaigns. The launch of Exterion Live signifies the company’s ongoing investment in new technologies and the use of data-driven insight that enhance the consumer experience for the urban audience and create new commercial opportunities for clients. Consumers are increasingly looking for memorable experiences, with research from Exterion Media’s award-winning national consumer panel work.shop.play. revealing that 98 per cent of consumers are more inclined to purchase post a brand experience. The latest IPA figures also show that on average 12.3 per cent of briefs are being allocated to experiential marketing, outperforming all other major marketing channels. This launch by Exterion clearly responds to consumer demand, and is in line with industry growth. Exterion has also introduced an end-to-end booking portal for experiential agencies, to be the hub of the Exterion Live offering. Streamlining the booking process for experiential agencies, as well as giving clients live availability of experiential spaces, the portal is designed to be completely transparent, and offer real-time updates throughout the booking process.